These Kava Root-Only Capsules from Kona Kava Farm and contain nothing other than their world-renowned, organic-blended Kona Kava Root. For the kava connoisseur who doesn't need a big kick in the pleasure centers when imbibing with Kava, or for those looking for a gentler Kava experience, these Kava Capsules are definitely for you. These are a nice accompaniment to other relaxing herbs such as Kanna, or can be enjoyed on their own for gentle relaxation or relief from stress and anxieties of the day. 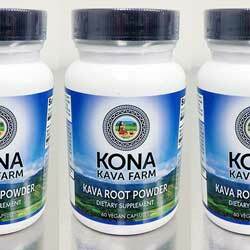 These Kava Root-Only Capsules from Kona Kava Farm contain nothing other than their world-renowned, organic-blended Kona Kava Root, not to be compared to non-organic, commercial Kava root independently tested to be much weaker. These capsules contain only pure powdered Kava root, and can be enjoyed for their pure kava experience, preferred by many. For the kava connoisseur who doesn't need a big kick in the pleasure centers when imbibing with Kava, or for those looking for a gentler Kava experience, these Kava Capsules are definitely for you. These are a nice accompaniment to other relaxing herbs such as Kanna, or can be enjoyed on their own for gentle relaxation or relief from stress and anxieties of the day. Directions: 2 or 3 capsules, no more than 3 times per day. Caution: If using prescription medications, seek the advice of a health care professional before using this product. Not to be taken during pregnancy or if breastfeeding. Not for use by persons under the age of 18 years or with alcoholic beverages. Keep out of reach of children. Used in excess or with substances that induce drowsiness, the ability to operate heavy equipment or a vehicle may be impaired. Individuals with an existing liver condition or those at risk of developing one should consult with a physician before use. US FDA advises that a potential risk of rare, severe liver injury may be associated with Kava-containing dietary supplements.